Born in 1989, Hopare is a complete artist who mixes abstraction and representation in a dynamics making re-appear the memories of the Italian futurism of the beginning of the XXth century. 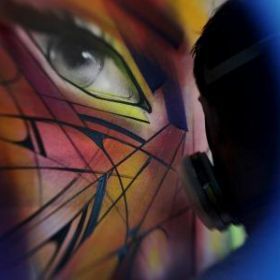 The modernity, the speed, the movement, the new man, his relationships with the city, a vital energy simply, seem to lead the works of this young talented graffiti artist. The strips of colors interlace to the forms and the faces appear of their media. Hopare journey and moves forward with its characteristic "wheel" and he allows us to follow him on this road marked with poetry and with magic, in his colored and organic universe which cuts with the daily greyness of the streets where it takes place. His portraits are particularly moving thanks to this particular technique of fine "silk ribbons" bounded by a black “ nylon threads" with a maximum of details. Colors are vaporous and aerial, they submit themselves to the movement of the line, the line and the structure so important in the graffiti. It is also this flexible linearity which gives this special cachet to the work of Hopare, a sensibility to the other who allows to become identified with the represented timeless model. His portraits realized on painting allow to feelr( still a little more the precision and the tactile character of the line, we go into a much more intimate dialogue inside the gallery. The transparency of tones and their freshness add an emotion and an echo to the structure which invites us to travel towards a distant, fragile and magic somewhere else. Nowadays, Hopare is exposed at the gallery Bartoux Worldwide, has realized canvas and walls for internationals brands and has recently joined the Benetton Foundation for Imago Mundi.